As cliche as it sounds, I can't believe we are here. A new year is beginning and we're already 14 years into the 2000s, which used to sound so futuristic. Even though it didn't look much like I dreamed, 2013 was a good year. God's continuing a good work in me and with my family. Naturally, I'm a perfectionist who likes to be in charge and has opinions about most anything. God's been working on this part of me for awhile now. Embracing imperfection was my theme for 2013, and that's why IMPERFECT was my one-word focus this past year. As I take steps into the new year, I know he's continuing that work in a more internal way. I feel like it's easy for me to invite people into my house even if there are crumbs waiting to be swept. I can let go of chores in a way that used to drive me crazy. But internally I still struggle with wanting to maintain order. I've been known to verbally erupt all over my kids and husband. Recently, I can across that picture above from Isle of Palms, South Carolina, when I was looking for something else. I really like the contrast of the darkness being the background. The grass upon the sand seems to divide the light and dark. I've been in the darkness that comes with making demands, holding onto life too tightly, and stressing to maintain order to be in the distance. I'm yearning for the other side, where the light really is marvelous. I've had "Marvelous Light" by Ellie Holcomb playing often lately. A blogging friend gifted me the song. She had no idea how it was exactly what I needed. Well, actually I had no idea either. 1 Peter 2:9 :: "But you are a chosen people, a royal priesthood, a holy nation, God’s special possession, that you may declare the praises of him who called you out of darkness into his wonderful light." John 8:12 :: "When Jesus spoke again to the people, he said, 'I am the light of the world. Whoever follows me will never walk in darkness, but will have the light of life.'" Matthew 5:16 :: "... let your light shine before others, that they may see your good deeds and glorify your Father in heaven." Matthew 11:28-30 :: "Come to me, all you who are weary and burdened, and I will give you rest. Take my yoke upon you and learn from me, for I am gentle and humble in heart, and you will find rest for your souls. For my yoke is easy and my burden is light." God created the light that is day and the darkness that is night. And he's been in charge from the beginning. I want to be a light that glorifies him and in doing so I know he lightens my load, giving me more opportunities to delight in everyday life. And, really, there's no place I'd rather be than in his marvelous light. There you have my one word for 2014: LIGHT. Do you make resolutions or perhaps choose a word to focus on in the new year? If so, what's on your mind as we start again? I'm joining others approaching the new year with a new focus: Compassion International bloggers. One Word 365. Circles of Faith. Three Word Wednesdays at Simply Beth. Oh I like your word for this new year!! Am excited to see what God teaches you this year! Thanks, Kristin! Happy new year! Me too, love your one word for 2014!! Love your word for the year, friend! Looking forward to reading more about what He teaches you. :) Blessings and Happy New Year! I really like your word. It really hit me maybe because I started reading from Genesis this morning. And this..."...really, there's no place I'd rather be than in his marvelous light." Amen! I'm so looking forward to this coming year. I'm excited to see how He moves in each of our lives. Love you! Happy New Year!! There is something refreshing about a new year, like a clean slate. Cheers to trusting God with whatever he has for us. Much love to you. I'm loving your word this year. So thankful that God surrounds us with His light. May the light of His face shine upon you in 2014! Thanks, Barbie! Happy new year to you! Hi Kristin, I feel like it's Deja Vu all over again...I love the word light...and your thoughts on this too. I especially appreciate all your "light" words in that wonderful last paragraph. I never thought of "delight" being a light word, but of course it is. Blessings for a light-filled new year! You know, I think I saw your comment come into my email and I thought I even responded, but it did seem to disappear from here. Who knows! I'm glad you came back though. 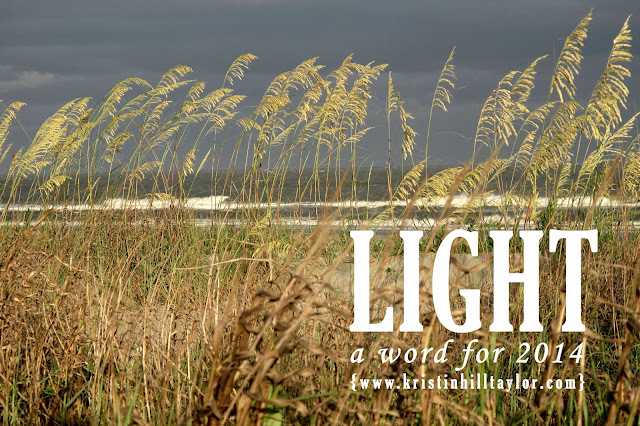 :) I hadn't linked light and delight until I was reading "light" scriptures a couple weeks ago. It was the same day every scripture I read and every song I heard referenced LIGHT. I knew God was talking to me. It's always nice when he makes it clear like that.